The RPS 75i rotor is designed with intelligent flow technology, making this rotor great for any residential or light commercial application. 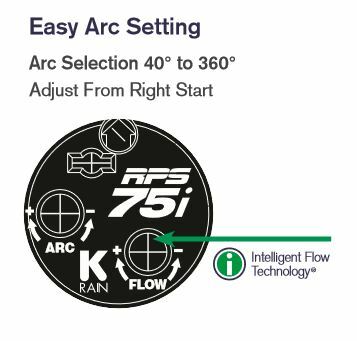 The RPS75i has all of the great features and benefits of the RPS75 plus just a simple turn of the patented Flow Shut-Off, controls the distance and water flow proportionately up to 50%. The even water distribution eliminates dry spots and provides better zone performance, while saving you water. Each rotor includes eight standard angle and four low angle nozzles. All this makes the RPS 75i the right rotor for every landscape!